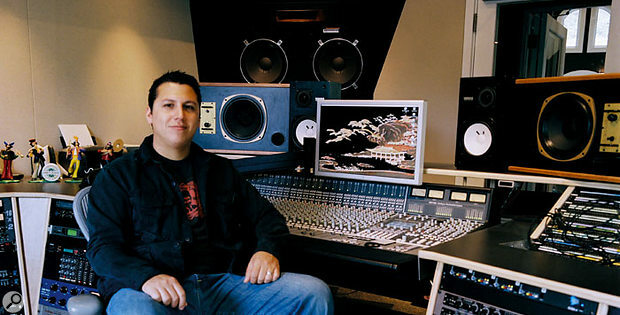 Mike Elizondo has gone from being Dr Dre's right-hand man, co-writing some of the biggest hip-hop hits of recent years, to being an innovative producer in his own right. He might not be a household name, but Mike Elizondo has been involved in the making of an astonishing number of hit recordings. Since his credits first began appearing on official releases 10 years ago he has, as a bassist, keyboardist and guitarist, performed on albums by a strikingly wide range of artists, among them the likes of Eminem, 50 Cent, Jay-Z, Ice Cube, Dr Dre, Snoop Dogg, Xzibit, Macy Gray, Sheryl Crow, Ry Cooder, Avril Lavigne, Ricky Lee Jones, Gwen Stefani and many, many others. The high proportion of hip-hop artists in this list reflects Elizondo's close partnership with Andre Young, aka Dr Dre. Elizondo worked on the instrumental version of the producer's 1999 solo album 2001, and the pair ended up co-writing and co-producing. As a team, Elizondo and Dre were the creative forces behind the music for recent mega-hits like 'The Real Slim Shady' and 'Just Lose It' by Eminem, 'In Da Club' by 50 Cent, 'Let Me Blow Your Mind' by Eve featuring Gwen Stefani, 'Family Affair' by Mary J Blige and several more. Since then, Elizondo has begun producing in his own right. Fiona Apple's Extraordinary Machine was the first entire album he single-handedly produced, and has attracted universal acclaim, while he also worked on Pink's latest album I'm Not Dead. Speaking from his home in Los Angeles, where he lives with his wife and three young daughters and has a state-of-the-art recording studio, Elizondo reflects: "My father is a professional musician and an avid record collector, so I grew up with a very broad sense of what kinds of music are available. Everything from P-Funk to Al Green, to Jimi Hendrix, to the Beatles, John Coltrane, everything. I was really fortunate to be able to listen to music without boundaries. In working as a bass player, songwriter and producer I try to take the same approach, which is to have no boundaries and just be open to the different experiences that come up. I don't want to be pigeonholed. Mike Elizondo's main instrument is still bass guitar, and he is an in-demand session player. Photo: Eden Bakti"I began playing piano at age nine, saxophone at age 12, and bass aged 14 at high school because there were no other bass players, so I did not have any competition and could immediately become the best bass player at school! The reason that playing bass stuck was that the role it has, whether you're playing acoustic or electric or keyboard bass, is very appealing to me, because you are the link between the rhythm and the melody. I also enjoy not being the lead singer or lead guitarist, instead remaining in the background, knowing that I have an integral role but that not everyone is watching me." Similarly, as a songwriter and producer Elizondo plays a fundamental part in the creation of music, without attracting too much attention. For him production and playing bass are complementary activities. "It appears to me that a great number of bass players are able to hear everything in an arrangement, what the drums and the lead vocal and the harmonic instruments are doing, and then wrap themselves around this. Without a doubt this means that you're listening to music in a production sense. I love being around the process of making music, whether it's producing, writing a song, or just playing bass. I get equally excited about these things, which is why I'll continue to do session work. But of course with so many production opportunities now coming my way, I'm very selective about the sessions that I choose to do." Elizondo's career-defining moment occurred when he first joined Dr Dre in 1996, at the age of 24, for the recording of The Firm (featuring Nas, AZ and Foxy Brown), on the recommendation of an old school friend, Richard 'Segal' Huredia, who was working as an engineer with Dre. Elizondo was at the time also working with big-name producers like T-Bone Burnett, Matthew Wilder, Matt Wallace, Glen Ballard and Steve Lindsey, but it was his work with Dre that took him to another level. "I came in and played some bass lines on a few songs, and fortunately we hit it off musically," recalls Elizondo. "He kept calling me for more sessions, and this evolved into me participating more with songwriting, beginning with Eminem's 'The Real Slim Shady' , and then moving into production. The things I did with the other producers opened up opportunities as well, but Dre gave me my first writing and production credits." 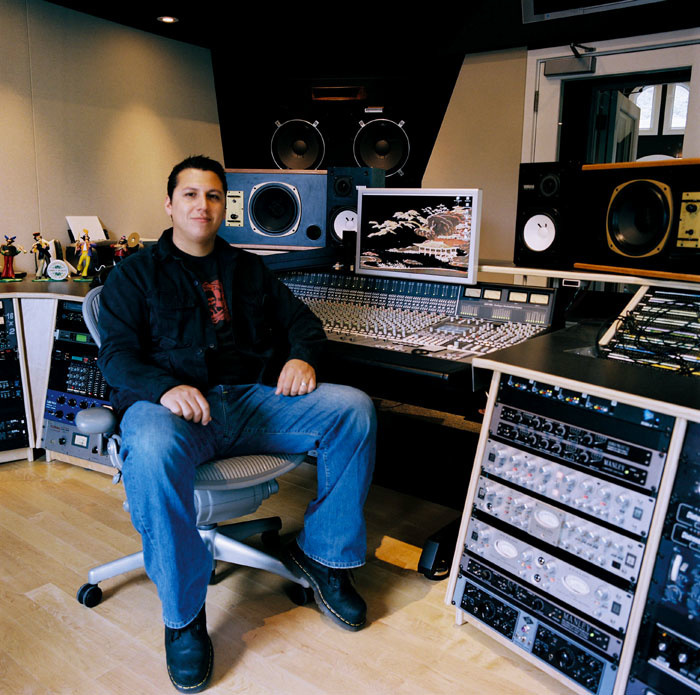 Recording at Phantom Studios is handled by a large Pro Tools rig and an SSL AWS900 controller/mixer.Photo: Eden Bakti'The Real Slim Shady' was released as a single and as part of Eminem's The Marshall Mathers LP (2000). "The album had already been mixed," explains Elizondo, "and we had some time to kill in the studio, and that song arrived in the same way all the others had. Basically, we began with a drumbeat that Dre programmed into an MPC3000. At the time we were working with a keyboard player called Tom Coster Jr, who had this harpsichord-like sound, and I was playing bass, and we simultaneously came up with the parts that evolved into the track. Eminem was in the studio, and when he heard the piece he immediately reacted to it, and had a concept ready to go. I later doubled the electric bass with a keyboard bass that I had programmed on a Nord Lead. "The MPC is Dr Dre's priority instrument, above anything else. It has become a staple in so many forms of music because it is very musical and intuitive. We have a lot of sound libraries for it at our fingertips. We sometimes use a sample from a record to create a small loop and maybe layer it with a kick or snare, but in general Dre likes to have all parts separated, and so prefers to program everything in the MPC. When you have a loop there's only so much you can change in the balance by adjusting low end or high end. So the drumbeats were usually started from scratch in the MPC. "The MPC is the session brain from which the MIDI clock is run as well. During the sessions with Dre we set up with maybe two or three musical stations, and my station will have a guitar rig and a bass rig and a soft-synth rig, which is basically a G5 with everything from Reason to Logic and a whole library of sounds and samples and soft synths. I have Native Instruments libraries and the ESX sampler in Logic. I also have a loop machine that receives MIDI clock and that allows me to loop a guitar or bass. It might be a four- or eight- or 16-bar idea, and I can punch myself in and out of a particular loop that is synced up to the MPC. "The main loop machine that I use is called a Repeater, made by a company called Electrix. It's primarily made for DJs to grab bits and pieces of records, have MIDI if they're programming drumbeats, and they can then loop things and have it be in time. 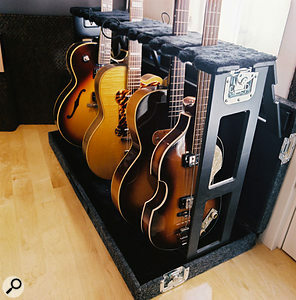 You can also plug your bass into it, or a Fender Rhodes, anything, and it allows you to record in time to a MIDI clock. As for the G5, at the time it was the only Apple machine with a processor powerful enough to allow for extensive layering of sounds without crashing. Now that Apple have come out with laptops with the Intel Core processor you can get the power of a G5 in a laptop." Several other mega-hits in which Elizondo was involved, like 'In Da Club' by 50 Cent and 'Family Affair', by Mary J Blige, came into being according to a similar process, with Dre, a keyboardist and Elizondo working on backing tracks. "On a good day we'll get anything from 10 to 15 ideas in one session," says the bassist. "Rather than separate all the sounds, we make a decent stereo mix of an idea, record it, and move on to the next idea. We used to record to DAT and now record to CD-R, but the aim is the same: to quickly catalogue all the ideas we have. The engineers make notes of all the sounds, so that when the artist comes along and he wants to work on a certain track, we can immediately recall everything. "Dre and I had written 'In Da Club' for a different artist and it sat around for a few months, until 50 Cent came into town and we played it for him. He immediately gravitated towards it, started writing, and very quickly got the hook and the intro. That track was finished pretty quickly after he started to work on it. 'Family Affair' was again Dre with an MPC3000, myself and a keyboard player throwing out ideas. Mary J Blige added her vocals to that track." Perhaps the most crucial piece of kit in Mike Elizondo's arsenal is the son-of-MPC3000, the MPC4000. "The MPC4000 is the machine I learned my sequencing skills on, and it continues to be the quickest way to sequence for me. I've done a lot of sequencing in Logic as well, but I know how to operate the 4000 without thinking. So I often use sounds in Logic, but sequence them with the MPC. For me, working with a computer is very different than with a workstation. There are certain inaccuracies that allow dedicated machines to feel almost human-like. They are very intuitive, you can get a great feel out of them, and it's easier to manipulate things to feel a certain way. The MPC4000 has a certain feel, just like the old SP1200 drum machine had a certain feel, or the Roland 808. "One issue big for me are the computer screens. What did we look at while making records not so long ago? Nothing. Now we all look at screens and sometimes I wish we could go back to the days when we just listened with our ears. I have my screens set up in such a way that I can move them away from the mixing monitors. That definitely helps at times. Computers are great tools, but I don't necessarily like looking at them. I have separated my computers into two separate rigs. One computer is dedicated to soft synths and keyboard sounds, and another is set up for Pro Tools. When I'm working in Pro Tools I don't want to be dealing with keyboards, and vice versa. Even so, I'm still most comfortable working with the MPC4000. I may abandon it in the next few years and only do things in my computer, but my journey hasn't led me there yet." "Once the vocals are laid down, we get into a different mindset, focusing more on the overall arrangements, where you try to make certain sections, like the chorus, come alive. With hip-hop you have four or eight bars repeated over and over again, and the trick is to make that interesting, trying to get an arrangement where there may be a sound in the second verse that's nowhere else in the song. It may be subliminal, but might give a certain mood or texture. Even though the basic track in hip-hop tends to stay the same throughout, you are embellishing parts, based on the rhythm of the vocals or what is being talked about lyrically. "Embellishing is a matter of trial and error, trying different parts, different keyboard sounds and sections, for instance, on 'In Da Club', an eight-note guitar part in the chorus to make that come alive, and so on. With 'Family Affair' we adjusted the arrangements in relation to her verse, chorus and bridge. I think we added a string part after the second chorus, where she goes into this really swirly vocal thing. We probably also added some Fender Rhodes chords here and there or some string pads, to embellish the mood of what she sings. By contrast, Eminem's 'Just Lose It' didn't need a lot of extra stuff, because his vocals carried most of it. Some of the rackmount gear at Phantom Studios. Left, from top: Manley line mixer, MOTU MIDI Timepiece synchroniser (x2), MOTU 828 interface (x2). 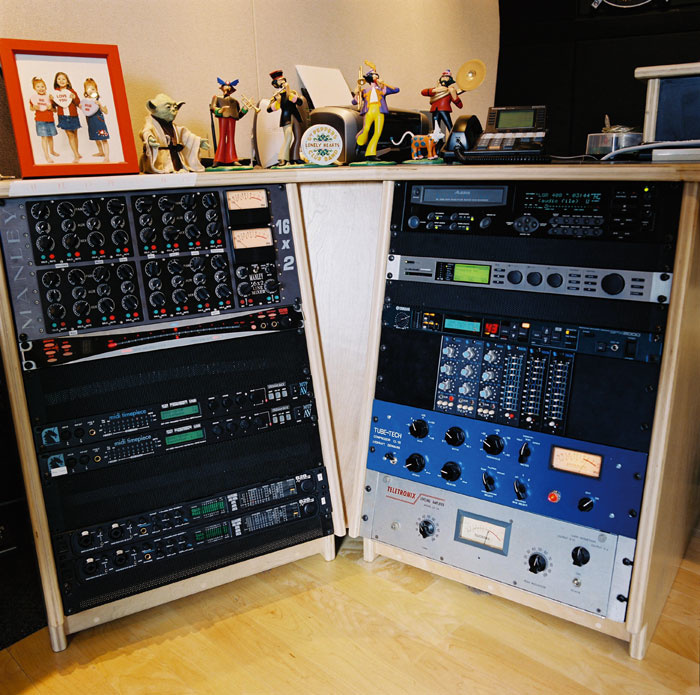 Right, from top: Alesis Masterlink CD master recorder, TC Electronic Fireworx effects, Yamaha SPX200 effects, API parametric and graphic EQs, Tube-Tech CL1B compressor and Teletronix LA2A compressor.Photo: Eden Bakti"Each song has its own challenges. Even though it is the same harmonic progression, you can do things to really lift certain sections, to make it sound as if there is some sort of form to the song, as opposed to just a bland loop without any changes. It's actually very challenging to make a four-bar loop or chord progression sound interesting for three and a half minutes, to make it sound like the chorus is lifting up for instance. A lot of these embellishments happen as we are simultaneously mixing. Dre is very hand-on with the mix, and he'll make suggestions to add parts or bring certain things out." Surprisingly, it wasn't until Eminem's fourth album, The Eminem Show (2002), that Dre and Elizondo made use of digital recording. Elizondo gives the lowdown on why they stuck with analogue for so long. "The first two Eminem records we worked on, The Slim Shady LP  and The Marshall Mathers LP , were recorded to two-inch analogue, basically for sonic reasons. Sound quality is really important for Dre, and he's extremely in tune with how things fit in a track. I learned a lot from watching him and the attention to detail he has — the amount of time he can spend on just getting a snare or a bass drum sound. 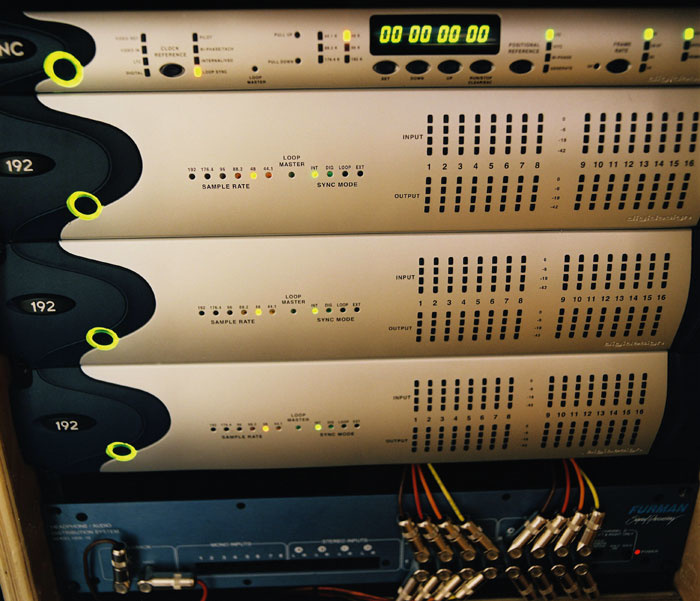 But once Pro Tools stepped up their game in terms of sonic quality with the 192 audio interfaces and HD, we began using that, mainly because of the speed with which you can work. "With analogue you have to take out the razor blade to do edits, but with Pro Tools you have this instantaneous ability to move things around. When we used analogue we were more or less obliged to play parts from beginning to end, all the way down. Even as you tried to play it like a loop, you still had a human element to it. Now with Pro Tools we have the option of looping things. It depends on the track whether you want that human element to it, or have everything just totally locked. On 'The Real Slim Shady' I played the bass line all the way down, but 60-70 percent of 'In Da Club' was sequenced. "By the time we did [Eminem's 2005 hit] 'Just Lose It', we had completely embraced the Pro Tools process of working. That song had a lot of sequencing. I think the bass sound came from a Minimoog soft synth made by Arturia, while the main keyboard riff came from a soft synth called Plastix, and there was another sample that [keyboardist] Mark Batson played, which was a random snippet of a percussion part from a sample library. The song was mainly soft synths, all done in the G5." By the time Elizondo worked on 'Just Lose It', he had established an impressive pedigree as a co-writer and co-producer on a range of massive hits. The co-production credits with Dre were in recognition of, said Elizondo, "my involvement in the bulk of the music and having a hand in the arrangements". All this resulted, one imagines, in the Californian having a tidy sum of money at his disposal, and like many musicians in his position, he set up his own studio. Called Phantom Studios, it is based around an SSL AWS900 analogue mixing console/DAW controller and three Pro Tools 192 units. "The studio has about 1000 square feet of floor space, and there's a live room, a control room and a lounge," explains Elizondo. 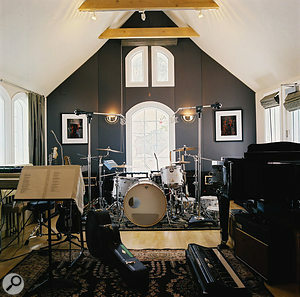 "Because I have a family, I wanted to have a studio close to home. I also wanted a studio where I would have everything I need, and am able to create on the spot. And I wanted a studio that would be comfortable enough for established artists, yet where I can also work with people who don't have a budget or deal. To be able to do what I want is to me the greatest freedom. The live room at Phantom Studios.Photo: Eden Bakti"When I first built the studio I had a Pro Control in here, and soon after the studio was completed SSL announced the AWS workstation, so I had to move things around to have that wired in. Having that console is a huge advantage to me: it's an analogue mixer with SSL EQs and everything, and it also enables me to control Pro Tools. It's great to do everything in Pro Tools and then be able to separate things out across 24 channels for mixing. "I like to embrace both the analogue and the digital worlds. I like to juxtapose some of the digital harshness with analogue warmth. I have lots of different analogue boxes, like Urei 1073, API 5050 and 5060, Avalon, Universal Audio, Urei 1176, Neve 2254, Manley line mixer, and so on. It's a combination of older and newer gear. I also have a lot of microphones, like the Telefunken M250 that's great for vocals, the Royer 122, which I love, and I'm a big fan of the Blue Bottle, which is probably the most versatile microphone I have. Unbelievable. I also have a couple of C12s, U67, U47, Sennheiser microphones, SM57s and so on." While the AWS plays a crucial role in integrating this wealth of analogue kit with Elizondo's digital system, he's far from a retro man. "I'm plugged in like crazy," he says. 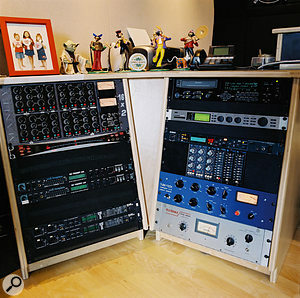 "I have every plug-ever in made, everything from Waves stuff to Digidesign stuff. I recently received the Waves SSL plug-in, which gives you an amazingly accurate compressor and EQ based on the signal path of what I think was a G-series SSL strip. "I'm also a big fan of soft synths. There's nothing that beats the real thing, like a Fender Rhodes or a Wurlitzer, but in the context of a track you're not going to pick up all the missing nuances between reality and a soft synth. 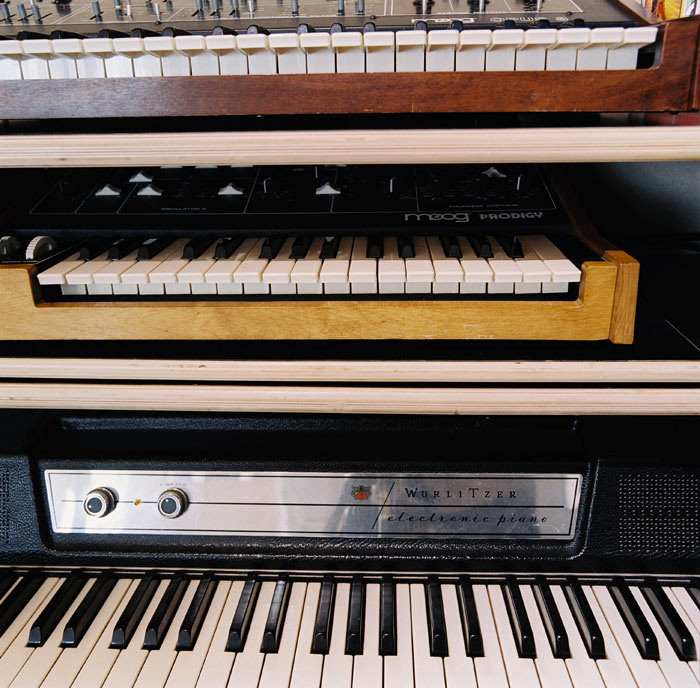 Not everybody can afford every synthesizer in the world, let alone have space for them. At the same time I have picked up a number of keyboards over the years, like the Fender Rhodes, a Wurlitzer, an old Clavinet, Minimoog, Prophet 5, Roland Jupiter 8, Oberheim OB8 and Juno 106. I love the original keyboards and fortunately have the space and means to put them here." Elizondo has had his studio up and running since the autumn of 2004, and immediately put it to use writing, recording and producing songs with Pink for her I'm Not Dead CD (from their sessions, only the track 'I Got Money Now' is included on the album), and most notably, as player, arranger and main producer on Fiona Apple's Extraordinary Machine — an album which had a tortuous gestation period. Despite the fact that Apple's first two albums had gone platinum in the US, Sony/BMG refused to release her third album when she delivered it in the beginning of 2003. Made with arranger/producer Jon Brion, the label judged it too arty and abstract. Furious fans began a campaign for its release, and eventually Apple and her record company started talking again. The singer was perhaps moved by the fact that when tracks from the album were leaked on the Internet, many agreed with the record company that the carnivalesque orchestral arrangements were laboured and indulgent. Apple agreed to re-record her songs with another producer, and in the beginning of 2004 hooked herself up with Elizondo. 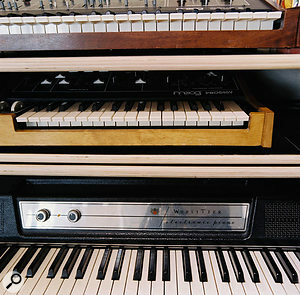 Some of Elizondo's many vintage keyboards: from top, Moog Opus 3 string machine, Moog Prodigy synth and Wurlitzer EP200 electric piano.Photo: Eden Bakti"I was presented with the material that Fiona had worked on with Jon Brion, and for one reason or another she wanted to hear different interpretations of them," recalls the bassist/producer. "I used his versions to learn the material, sitting down at the piano to work out the chord progressions and get a sense of what Fiona was doing vocally. I didn't use or borrow anything from what Jon had done. Not to say that Jon's versions were demos, but I get presented with artist's demos to work from as a springboard a lot of the time, and working like this was no different. I would do two or three songs at a time, and then presented them to her." Elizondo declares himself a big fan of Mitchell Froom, and his production on the Fiona Apple album certainly recalls Froom. Strange sounds come in and out all the time, without distracting from the songs. "The album was actually recorded before my studio was finished," explains Elizondo. "So it was done in a bedroom here in the house while my studio was being built, with Pro Tools and a small little controller, and some Neve modules. "I would lay down the basic tracks and then I brought in other musicians to embellish things. We used a combination of soft synths and real keyboards for the keyboard sounds. There were some Mellotron and Chamberlin sounds from a library, and in other cases we used the real thing. Sometimes we went to Gigastudio for some cool string sounds or some harp sounds, thing like that. To be honest, we used whatever was available to us on the day. Those weird sounds at the beginning and end of 'Get Him Back' for instance are from the library of Keefus Ciancia, one of the keyboardists. On the track 'Timps' I programmed a rhythm on the MPC4000 that I thought would sound cool with Fiona's vocal, and then we layered that with real marimbas, vibes, piano, a whole load of keyboards, and I played Minimoog bass on it. I felt that Fiona's piano parts called for something ethereal. "We tried to create something unique for each song. I like to push the envelope and come up with interesting sounds and arrangements, while at the same time serving the artist's vision." At this, he's been more successful than most.